Van Halen are working on their first album in more than a decade, and they're runnin' with David Lee Roth. Twenty-six years after they last recorded together, the hard-rock band have reuinted with their original singer, with an album planned for next year. Although the band have not announced the news themselves, their publishing company spilled the beans in a recent press release. 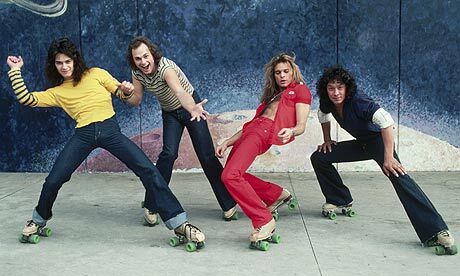 Warner/Chappell Music's comments at first seemed dull, stating simply that they were renewing their publishing deal with Eddie and Alex Van Halen. But the end of the notice confirmed rumours that had been circulating for months: "The group is currently in the studio recording an album with Roth that is due for release in 2011." 2CD Edition I 4CD Edition: For nearly 25 years 'Love' has been a consistent seller (over one million copies in Europe alone), endorsing its classic status in The Cult's repertoire. The Omnibus Edition is presented as a lavish box set with the CDs in Japanese-style paper sleeves, reproducing the original vinyl cover art, accompanied by a 48 page book. 'Love' has been expanded into a 4 disc set – as well as the re-mastered original album, the box also includes bonus discs featuring all the tracks from their 1985 UK singles including the remixes of 'She Sells Sanctuary', demos and live recordings from 1985. The Expanded Edition is a 2 disc set featuring the album re-mastered from the original studio tapes alongside the bonus singles disc. The release is packaged in a slimline jewel case inside a card slipcase, with new notes by the journalist James Brown.